8-bit Digital to Analog converter, generally used for controlling a spindle motor drive. 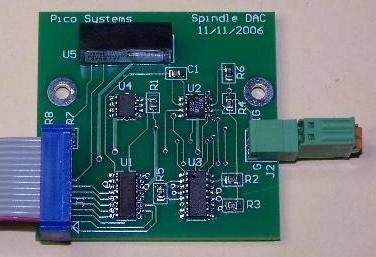 It can be attached to any USC or UPC board, and is controlled by the PPMC driver in LinuxCNC. It is capable of outputting 0 to +10 V or -10 to +10 V, as selected by jumpers. If set for bipolar output, it watches SSR's 1 and 2 for polarity. A cable to connect to controller board is included.